This was a straight up follow on from the previous year's "Good As I Been To You" - Dylan with his acoustic guitar and harmonica, singing traditional folk and blues songs, enhancing them with his nasally, croaky ageing voice. He would have seemed to have been made for this material at this point in his life. The songs on both albums actually sound like Dylan songs in many ways, so they don't ever really seem like covers albums. The songs on here are more rural blues than eighteenth century folk airs, more sombre perhaps than the previous album's folky narratives. The sound quality, as it has been on the previous album, is clear and sharp, as is Dylan's voice. The title track is a mournful blues, immaculately sung with dignity and gravitas. "Love Henry" is one of the folkier songs. It is no surprise. however, upon listening to the lyrics, that it is about a woman murdering her lover. Most of the songs on the album are dark in nature, but, thinking about it, most folk/blues songs are. "Ragged & Dirty" has a finger-pickin' guitar backing and a real blues lyric of extreme poverty. "Blood In My Eyes" is another mournful blues, with some strong, melodic guitar. There is something that seems more essential about the choice of songs on this album, it has to be said, although it has proved not to have been as popular as its predecessor. "Broke Down Engine" has a guitar intro that briefly sounds like Elvis's guitar man. Elvis loved Southern blues, so he no doubt used his love of them when composing the song. It is a "Lordy, Lordy" upbeat but yearning blues sung out of desperation and deprivation. "Delia" is a song of a "gambling girl, who laid her money down....". It is a song of the old West as opposed to a Delta blues. Again, the guitar work is crystal clear and the vocal suitably sad and evocative. You feel this is a real labour of love for Dylan. His love and respect for the songs is clear to hear. "Stack-A-Lee" is another Western gambling tale, one that has been sung by many over the years. "Two Soldiers" is probably the song that is derived most from the folk ballad tradition. "Jack-A-Roe" and "Lone Pilgrim" are both folky blues, bleak in nature, as has been the whole album. 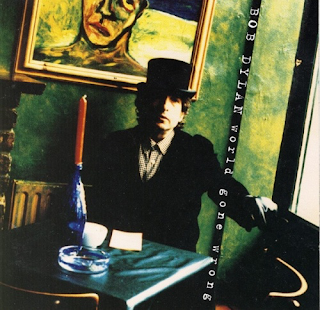 As with Dylan's recordings of "Great American Songbook" crooners, he ran the risk of producing one too many albums in the same style and of covers as opposed to his own material. As good and interesting as these two albums were, he was wise to leave it at that after the two albums. Unfortunately, with the crooners, as I write, he has yet to behave as wisely.